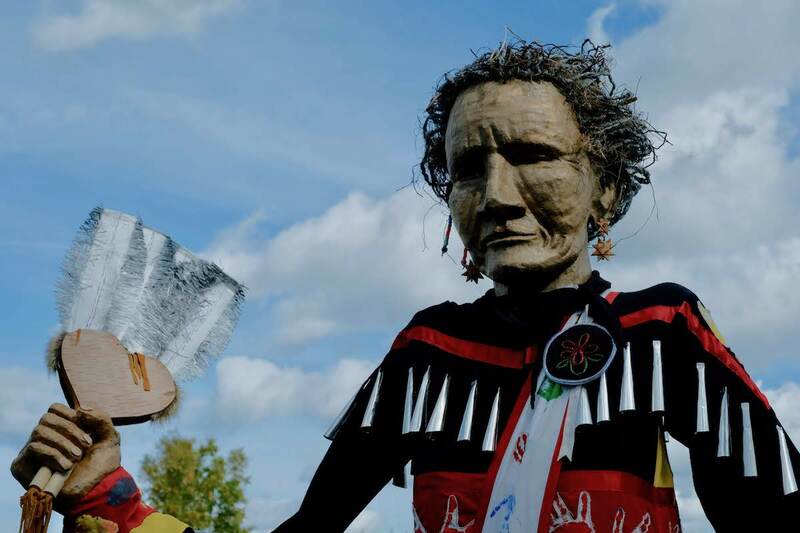 The 12-foot jingle dress dancer, designed by Chris Lutter of Minneapolis and built by members of the Native and non-Native community in North Wisconsin, makes its debut on Treaty Day, September 30, on Madeline Island. Puppet designer Chris Lutter makes a clay model for the paper mache face of the dancer. Lutter used tops of restaurant-size canned goods to make jingles for the dancer. Normally jingles are made from lids of snuff cans. The jingle dress dancer debuts at Treaty Day on Madeline Island and is joined by jingle dress dancers from throughout the region. Detail of the jingle dress dancer. Fawn Youngbear-Tibbetts of the White Earth Band of Ojibwe operated the puppet. The dancer’s dress also includes handprints of children who worked on the project. Katherine Morrisseau, one of the creators of the jingle dress project, dances along the shore of Amnicon Bay wearing an antique dress handed down to her by relatives. Morrisseau is a member of the Red Cliff Band of Ojibwe. Detail of Morrisseau’s antique jingle dress. Medicine is included in each jingle, according to Morrisseau. Bob Buffalo of the Red Cliff Band of Ojibwe is a descendent of Chief Buffalo. He is holding the pipe that Chief Buffalo smoked with President Millard Fillmore in 1852. The pipe was recently returned to the tribe by the Armstrong family of Ashland, Wisconsin. After smoking the pipe with President Filmore, Chief Buffalo broke the stem, signifying that the pipe had one purpose only. Detail shows carvings on pipe. Daniel Wiggins, a grass dancer from the Bad River Band of Ojibwe, pauses during a Jingle Dress Dancer workshop in Bayfield, Wisconsin. In September, journalist Mary Annette Pember visited Madeline Island, the largest of the Apostle Islands located in the Wisconsin area of Lake Superior, to learn more about the Madeline Island Jingle Dress Project ahead of Treaty Day. 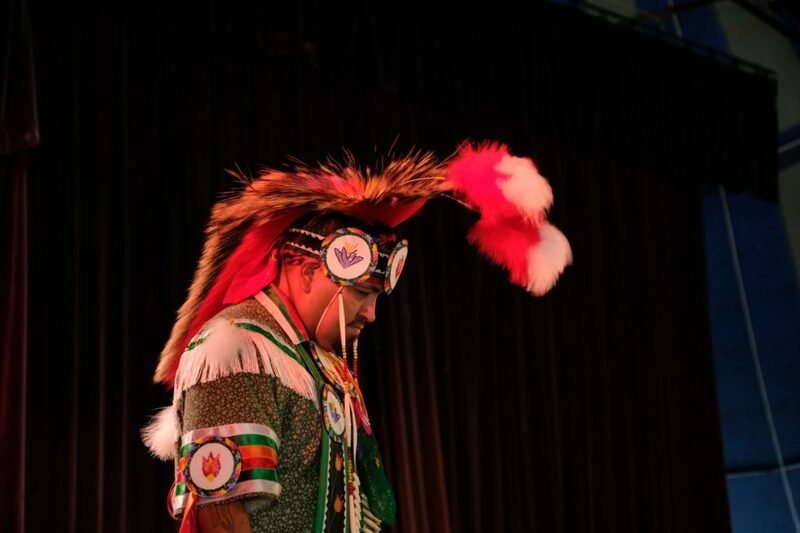 On that day, real-life jingle dress dancer Fawn Youngbear-Tibbets of the White Earth Band of Ojibwe operated a 12-foot jingle dress dancer puppet, which served as a healing and conspicuous symbol and reminder of Ojibwe history and presence. Read more about the project here.